1963, PONTIAC HUBCAP USED, VINTAGE, 14", CHROME OUTER RING, METAL, MACHINED, RAISED DOME & 3 BAR SPINNER, NO LOGO, WORD PONTIAC MOTOR DIVISION IN BLACK ON THE CAP. METAL CLIPS. 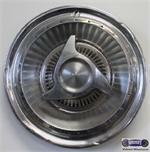 3792a-1, CENTER CAP USED, 05-09, FORD MUSTANG, CHROME 3 BAR SPINNER CAP, DARK GRAY CENTER, 6-7/8" DIA.